Video game adaptations of current cultural touchstones have been in vogue for a few years now. Game Of Thrones, Breaking Bad, and The Wire all got comic adaptations of their plots to old-school video games, The Great Gatsby got a playable NES-style game, and Joy Division inspired an interactive art piece. But for someone as mythically megalomaniacal and contradictory as Kanye West, the only game that could encompass his persona is a science fiction RPG. 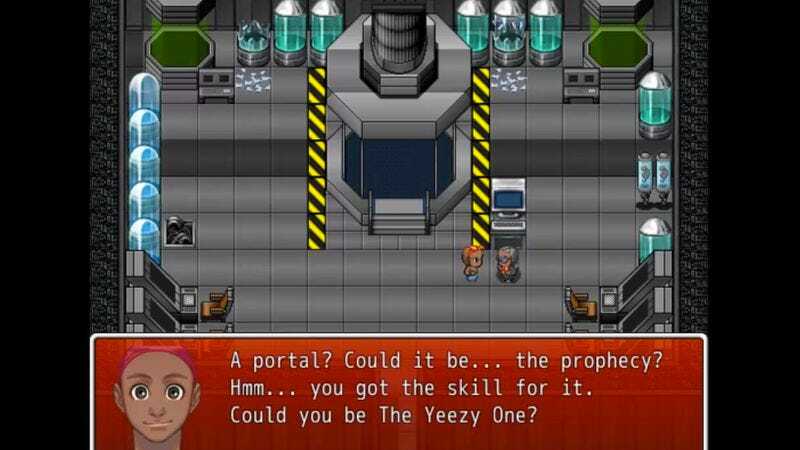 Though it’s not endorsed by Kanye himself, the Dragon Warrior-esque Kanye Quest 3030 transports Yeezy to a dystopian future where he must battle clones of famous hip-hop stars under the control of a godlike dictator. Kanye finds a microphone inside a power box, talks with a 2Pac clone, and attempts to enter the Based Cathedral, all scored to a piano rendition of “Power.” Though the alpha version is only playable on PC, you can download the game here, and watch the trailer below.